2. Place enoki mushroom in boiling water and simmer for 2 mins. 3. Blend dry mix with 125ml water. Stir in till broth thickens. Turn off fire. 4. Beat in egg. Serve hot. 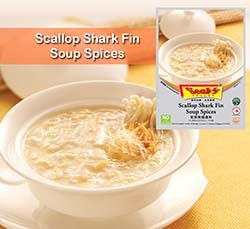 Note: To enhance texture and flavoring, include shark fin (250g) and crab meat (20g).